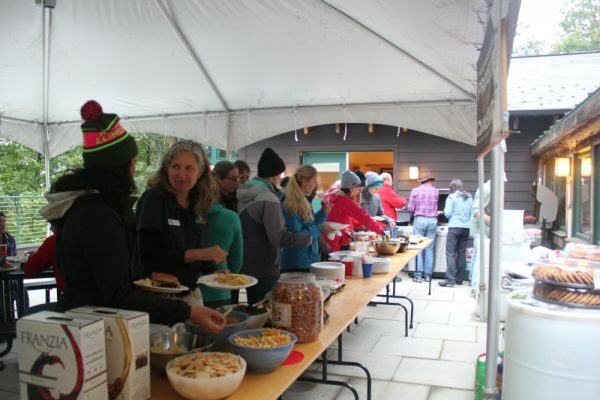 The Gunks Climbers’ Coalition welcomes in the 2017 Gunks climbing season with our annual spring members BBQ on April 29th, 2017 at 5pm. The event is free for GCC members, which includes food and drinks, and you can join or renew your dual Access Fund/GCC membership at the event. We are thrilled that Glynwood has donated delicious fresh grass-fed beef hamburgers again this year! We will also have snacks, appetizers, hot dogs, veggie burgers, salad, cookies, beer, wine and soft drinks. There will also be a raffle with awesome prizes! To get or renew a joint membership with the Access Fund and Gunks Climbers’ Coalition, join the Access Fund for an annual membership fee of $35 and check the box on the form that you want to “become a Joint Member with my participating Local Climbing Organization for an additional $15 and select the Gunks Climbers’ Coalition in the drop-down box. Or join/renew at the BBQ for a discounted rate of $35 for membership in both the Access Fund and the GCC! The event will be held at the Mohonk Preserve Visitors Center rain or shine. The event is over, thanks for your interest! Come and hear about our upcoming projects, mingle with fellow climbers, eat, drink and be merry! You must be 21 years old to drink alcohol. Bring ID. Park at the Mohonk Preserve Visitor’s Center. At the front door, turn left and come around to the back patio to sign-in. Entrance is not permitted through the Visitor’s Center building. Yes, this is a members only event to help raise funds for the Access Fund and Gunks Climbers’ Coalition. Joining or renewing at the event is $35 for a dual membership in the Access Fund and GCC, a $15 discount from the online price. Children under 12 accompanied by their GCC member parent can attend for free. Can I bring out of town friends (or children over 12) who do not want to join? Sure, admission for non-members is $15. Are the veggie burgers vegan? We will have salad and veggie appetizers, but unfortunately the Morningstar Farms veggie burgers we usually purchase contain egg whites. What if I have to cancel my RSVP? How can I contact the organizer with any questions?